Now this is how you design an insanely powerful boss monster for a deck. Not everyday does a deck’s main boss get banned, the only other one I can think of right now is Apoqliphort Towers for Qli and that’s back at three now. Master Peace brought something new to the Tribute Summon mechanic as the other True Draco monsters did, as Master Peace could be Tribute Summoned using Continuous Spells and Traps along with monsters. Not archetypal Continuous Spells/Traps, though there were a decent amount of them, but any Continuous Spell/Trap. If you summoned it in the archetype using their Spells or Traps, then those Spells or Traps would pop cards on your opponent’s field while you get a big boss, but not being specific to what kind of cards have to be tributed made this more splashable with other cards. 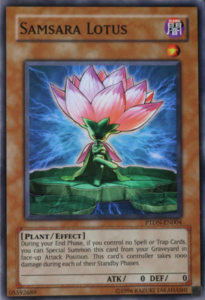 Master Peace was also unaffected by the kinds of cards used for it’s Tribute Summon (Monster, Spell, Trap) and it required two tributes meaning it could be unaffected by one or two of the different card types in the game. What also made Master Peace powerful was that during either player’s turn, if it was Tribute Summoned, you could banish any Continuous Spell/Trap from your graveyard to destroy a card on the field. This made Master Peace easily be able to disrupt any of the few outs this card may of had. 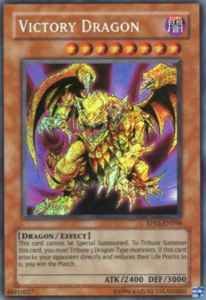 It was a very powerful boss monster that was banned in the TCG in May of 2018 because of how good it was in the True Draco deck since it could gain a ton of advantage with cards like Ignis Heat, Dinomight Knight (which was unbanned when this card was banned), and Dragonic Diagram (which the OCG also has banned). Now can Master Peace come back less than a year later? If you wanted to say it could come back, I’d say one at the most. I personally wouldn’t unban it at this stage, though. It is still a very strong boss monster that is still very hard to out for any deck while it can also get rid of cards that are trying to out it. I can understand why you might say one is fine, but I’d keep it banned especially with Dragonic Diagram being at three in the TCG. The only hand trap that is on the Forbidden and Limited List in the TCG is the ever so powerful Maxx “C”. Maxx “C” could be discarded at any moment to allow you to draw 1 card for every Special Summon your opponent performs during that turn after you activated Maxx “C”. Your opponent was then left with two options, keep going and give you a ton of advantage to out them or stop and give you more space to try and set up your own board and OTK. Now, if your opponent could OTK you or set up an insanely strong board then they’d likely continue, or if they knew they could Special Summon so much that they’ll deck you out. Most of the time, however; the opponent stopped in their tracks after giving you one or two draws and then it was your turn to do your thing. Your opponent could maybe set up a medium sized board that didn’t give you too many draws, that was an option, but it wasn’t that common. Now can Maxx “C” return? If it returns, it has to be at three and no other option. At one or two this card is too sacky for any duel where it’ll be less likely that both player’s see a Maxx “C” in their hand at the beginning. You need three to balance it out so if your opponent Maxx “C”s you and stops you, then you have a high chance of also drawing the Maxx “C” to stop your opponent as well. 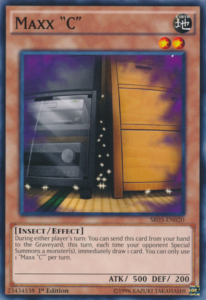 I think the card could be a good addition to the game again with all the combo decks that come around now, which Maxx “C” used to make not as appealing. I think Maxx “C” is welcome at three again, but no less unless it is staying banned, we don’t need people getting lucky by drawing the one of Maxx “C”. Mind Master was limited in September of 2009 likely because it was loopable with someone like Brain Research Lab to make it’s cost non-existent, but once you add cards like Serene Psychic Witch and Esper Girl into play, you can go into much larger combos. Even without the Brain Research Lab, you can abuse Witch and Esper Girl a bit with Mind Master to get cards to your hand while making several Synchro plays, including Naturia Beast and Barkion since there are a good amount of EARTH Psychics. This combo will get more insane as I said if you got Brain Research Lab to nullify the life point cost of Mind Master. The card can help make insane boards in Psychics. Now can Mind Master come back? Well anything you can do with Synchros, Links become an option as well since they are more generic than Synchros since not all of them require Tuners. 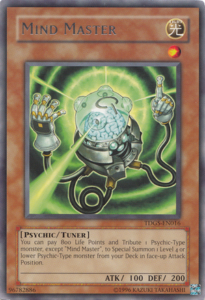 Mind Master will still be able to let you make big boards with Synchros and Links along with Serene Psychic Witch and Esper Girl I can imagine, so it cannot come back without a once per turn errata, because Brain Research Lab will just break it again. 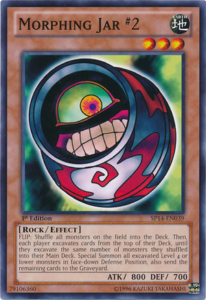 Morphing Jar #2 is the last FLIP monster I’ll talk about in the Forbidden section, but its effect is similar to Cyber Jar and eventually it got banned in the TCG in April of 2014. Upon being flipped, Morphing Jar #2 made both player’s shuffle all monsters on the field into the deck and then excavate cards from the top of their deck and summon any Level 4 or lower monsters that could be summoned in face-down Defense Position up to the number of monsters that player controlled when Morphing Jar #2 was flipped and any other cards excavated after you did all your summoning are sent to the GY. This could be a useful piece in the Empty Jar strategy to try and deck your opponent out along with the other Morphing Jar and maybe Cyber Jar if that was legal. The OCG still has this at three probably because they don’t care about Empty Jar as much. Now can Morphing Jar #2 come back? The Empty Jar deck isn’t fun to play against, no matter how consistent it is or isn’t. Maybe we can have it at three like the OCG, but I don’t think anybody really misses this card. It’s a case where you can bring it back, but nobody is heartbroken if you don’t. Here is a weird one. Upon the release of Breakers of Shadow, the deck known as Performages and Pals became Tier 0 and was dominating the meta earning over 90% of top cuts at major events, and that was mostly due to the powerful Performapal support in Breakers of Shadow along with the ever so amazing Performages in Clash of Rebellions and Dimension of Chaos along with some other cards in those sets indirectly helping the deck and a Rank 4 in Crossed Souls I’ll get to with the Extra Deck Monsters. The deck was so good that a few weeks after Breakers of Shadow was legal, they made an Adjusted Forbidden and Limited list to hit 6 cards and to this day only 2 of them stayed in their spot while the other 4 moved up or down the list, but none of them are at three. 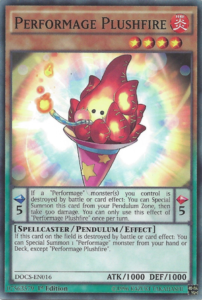 Plushfire is one of them that has remained Forbidden because when it is destroyed, whether in the Pendulum Zone or in the Monster Zone, it summoned any Performage from your hand or deck. This wasn’t a hard once per turn either, so multiples were made broken with cards like Luster Pendulum, the Dracoslayer and Performapal Pendulum Sorcerer. Plushfire floated so much into the Rank 4 pool along with making Ignister and Dinoster, this was before Number 38 was TCG legal, that the Adjusted List had to come to stop this deck from being so oppressive and now Plushfire sits Forbidden three years later. Now, can Plushfire come back? This is something I’m very hesitant to say, because I don’t know if 1 Plushfire alone will break the Performages and Pals deck wide open again, I know for sure that three would. In this era, we have three Wavering Eyes, two Luster Pendulum, and three Pendulum Sorcerer still along with Heavymetalfoes Electrumite at 1 now, so more than 1 Plushfire would be insane. Trying it at one maybe fine, but I’m scared to say cause I know how consistent Performages and Pals were and they might just need 1 Plushfire to do that stuff once more. Another card hit on that Adjusted List, but only limited at the time, was Performapal Monkeyboard. Monkeyboard was a Scale 1 where it’s Pendulum Effect only mattered because I don’t even know its monster effect by heart, and I know a lot of effects by heart. Monkeyboard in the scale once per turn let you search for any Level 4 or lower Performapal monster. This worked in tandem with cards like Pendulum Sorcerer to get searches and pop cards (especially when Plushfire was legal), search for Skullcrobat Joker for another Performapal search, or get Performapal Guitartle for the 6 scale or you could use Performapal Lizardraw for the 6 scale and pop it with another Performapal in the Pendulum Zone for a draw (this made for a Pot of Greed combo when combined with Guitartle). The deck was consistent with the Performages and once the reason to play the Perfromages was neutered, the deck involved into Dracopals, using a ton of Pendulum support like the Dracoslayers and Dracoverlords (despite Luster Pendulum being limited) and Wavering Eyes so eventually they hit Draco Face-Off and banned Wavering Eyes for a bit and when Dracopals wouldn’t die still, they banned Monkeyboard in August of 2016 and Dracopals were never really meta again. The Performapal archetype was huge, so of course they were going to have a ton of good cards, and man was that deck consistent. Now can Monkeyboard return? I don’t know how good the Dracopals variant of the deck will be good with Links, I feel Link Summoning might get in the way a little more than it would for the Performages and Pals deck that was basically at full power. I feel Monkeyboard at 1 is much safer than Plushfire at one since there isn’t anything that really abuses Monkeyboard, it just made for a quick one-card scale, plus Pendulum Sorcerer doesn’t have many good cards to pop. 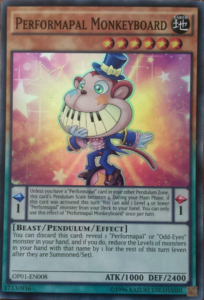 I know we got Electrumite, but I’m sure it’ll be fun for Pendulum players to experiment with a Monkeyboard again and see what Pendulum variants come up with the Performapals. The last card I will talk about that was hit on the Adjusted List is one that has a much weirder history than Plushfire and Monkeyboard, and that was the aforementioned Skullcrobat Joker. Skullcrobat Joker was very versitaile as it was a searcher for three archetypes: Performapal, Odd-Eyes, and (Pendulum) Magicians. It was a consistent piece of Dracopals and Performages and Pals, so of course it was going to get hit, but Dracopals were never as strong after Monkeyboard was back and Pendulum Evolution was about to come out, so to promote that set the TCG decided to give Magicians some support by unlimiting Performapal Skullcrobat Joker along with Wisdom-Eye Magician and Pendulum Call. This was fine at first, especially heading into Master Rule 4, but then Heavymetalfoes Electrumite came and broke Pendulum Magician wide open to where it got a ton of tops in the OCG. So in the TCG, they didn’t want Pendulum Magician to be as oppressive so just like how the banned Double Iris on the same list, they decided to ban Skullcrobat Joker. Joker was a searcher for so many archetypes, despite it having to take up your Normal Summon for the search since Pendulum Summoning it from anywhere wasn’t getting you any search, so it was obviously going to be very good. It made Performages and Pals consistent, Dracopals consistent when limited, and Pendulum Magician consistent and Pendulum Magician only became a problem with Heavymetalfoes Electrumite because the deck before, while meta relevant, was more balanced. Now can Skullcrobat Joker come back? This one I’m more confident about than Monkeyboard and Plushfire. With Astrograph banned and Electrumite limited, Skullcrobat Joker at one will be just fine, know that when the OCG limited Skullcrobat Joker the first time they kept it limited and it hasn’t moved yet. I’m sure Skullcrobat Joker will be handy for Pendulum Magician, Odd-Eyes, and Performapals once again. Even if it becomes meta, I can’t imagine it being broken with only 1 Joker. When this card got banned I wondered “how did we get to this point”? The answer is Topologic Bomber Dragon. 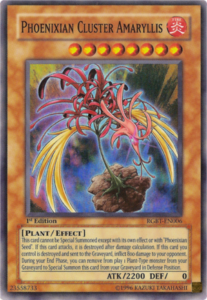 See, Phoenixian Cluster Amaryllis has two relevant effects that cause an FTK, when it is destroyed and sent to the graveyard you inflict 800 damage to your opponent as well as when Phoenixian Cluster Amaryllis is in the graveyard during your End Phase you can banish a Plant to Special Summon it in Defense Position. See all you have to do is load up your graveyard with Plants, including Phoenixian Cluster Amaryllis (you can’t Special Summon it except with its own effect or Phoenixian Seed, so find a way to dump it into the graveyard if you don’t want to summon it for Link Material) and once you get 10 or more Plants loaded into your graveyard with Topologic Bomber Dragon on the field, go to the End Phase and trigger Cluster to revive it to a zone Bomber Dragon points to so Bomber Dragon will destroy Cluster and burn your opponent for 800. Since no effect of Cluster or Bomber are once per turn, you banish a Plant to revive Cluster to a zone Bomber points to, Bomber will trigger to destroy Cluster and burn for 800, rinse and repeat. This gets more consistent when Aromaseraphy Jasmine comes to make playing Plants more consistent. Now can Cluster come back? No, it was just banned and nothing has changed about how it works or Topologic Bomber Dragon when it comes to an errata. Cluster needs a once per turn errata to be able to come back or Topologic Bomber Dragon needs a ban or a once per turn errata, though the errata really destroys the purpose Bomber Dragon really had. If nothing changes about those cards, then Cluster cannot return to the game, though I doubt nobody misses it since it was only used in that FTK during its entire existence probably. Another case of how did we get to this stage and the answer is the same, another Topologic Bomber Dragon FTK. This one worked with Knightmare Cerberus and Trickstar Black Catbat. 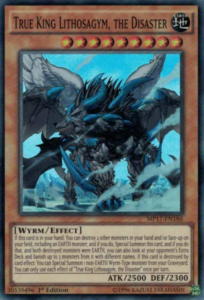 All you needed was to somehow get Trickstar Black Catbat and Knightmare Cerberus co-linked and Topologic Bomber Dragon in the Extra Monster Zone so none of them would be destroyed when Bomber triggers. Then all you got to do is revive Samsara Lotus during your End Phase by having no cards in your Spell or Trap zone to a zone Trickstar Black Catbat points to. Bomber will trigger since you summoned to a zone a Link Monster pointed to and destroy Samsara Lotus only. Catbat will trigger since the Samsara Lotus it pointed to was destroyed and your opponent gets burned for 200 damage. Since Samsara Lotus isn’t once per turn just like Treeborn Frog, you can just revive it and loop with Catbat and Bomber Dragon while Cerberus is protecting your Catbat due to being co-linked and you got a slower FTK. You could probably do this with Treeborn Frog, but that requires you to give your opponent a turn and they’ll likely stop that play from happening. I won’t even ask the question because it’s the same as Cluster, Samsara Lotus cannot come back without a once per turn errata, Bomber Dragon being banned or once per turn errataed, or Catbat being errataed to only work when Trickstars it points to are destroyed. This is another case though where nobody will care if it was unbanned once the FTK is no longer possible because the only time Samsara Lotus ever saw play was in this FTK. Oh boy, more FTKs. This one was back in 2010 before Links though, and it involves a ton of Frog Monsters. All you had to do was get Substitoad on the field and another monster, likely Swap Frog since it had a Special Summon ability and does something important for the combo. 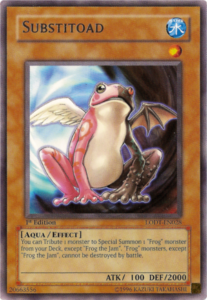 You then need to get Ronintoadin in the graveyard and then tribute the other monster you control to Special Summon a Frog monster from your deck. This isn’t a once per turn, so you rinse and repeat until you run out of Frog monsters in your deck (you should run at least 20, preferably more maybe). You then use Ronintoadin to banish a Frog in your graveyard to revive itself and activate Mass Driver and tribute Ronintoadin to burn for 400 damage. You then revive Ronintoadin again (you should have a ton of Frogs in the grave at this stage) and tribute it again for Mass Driver since it isn’t once per turn, rinse and repeat. This FTK was consistent enough to win the 2010 World Championship and eventually get Substitoad banned along with Mass Driver (though that was banned the next list and I’ll discuss that later). Can Substitoad come back? Simply put it, no. With an expanded card pool, people will figure out how to do this FTK with something like the Cannon Soldiers or Amazoness Archer (though Archer will likely need 2 Ronintoadins set-up). Also with Links being a thing, you get a ton of Link Fodder with Ronintoadin being able to keep reviving itself because you have 20 some Frogs in your grave. A simple once per turn will make this card fair, but until then we can’t have Substitoad in the game. This is sort of an FTK/OTK because your opponent likely isn’t outing what you have coming. 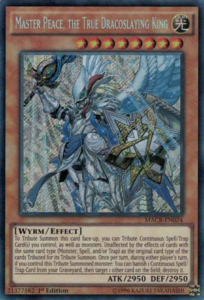 The Tyrant Neptune was released as a Jump Promo in May of 2010 and while it has cool effects, it was never broken until 2017 when Lyrilusc – Independent Nightingale came out. Tyrant Neptune could be Normal Summoned simply by tributing 1 monster, Independent Nightingale is always going to be tributed, but could use the two if you wanted to tribute something else because Tyrant Neptune gains ATK and DEF equal to the original ATK and DEF of the monsters used for its Tribute Summon, so Nightingale was going to at least give 1000 ATK. Also you have ways to get into King of the Feral Imps to search this without having to use your Normal Summon or maybe use Brilliant Fusion for another Normal Summon if you had to. Just use Instant Fusion for Nightingale, which has an effect where it gains 500 ATK x its level, is unaffected by card effects, and once per turn burns the opponent for 500 x its level. That isn’t threatening on the Level 1 Nightingale, but it is on the Level 10 Tyrant Neptune. When Tyrant Neptune is Tribute Summoned, it takes the effects of one monster used for its Tribute Summon (Nightingale) and then you get 5000 extra ATK, protection from other card effects, and the ability to burn for 5000 each turn. Tributing Nightingale and King of the Feral Imps if you used it to search for Neptune will make Neptune have 8300 ATK and burn for 5000, so if the opponent couldn’t out the nearly invincible 8300 ATK monster, then it burns for 5000 next turn and you win. The OCG or TCG did not want to deal with that and they eventually banned The Tyrant Neptune. Can Tyrant Neptune come back? Not with Nightingale still in the game, which she deserves a ban since Lyriluscs don’t even play it I think and she also got another card banned in the Extra Deck. Once Nightingale is gone, Tyrant Neptune can come back and hopefully another card doesn’t break it open again. Tribe-Infecting Virus was limited in November 2003 upon the release of Magician’s Force mostly because at the time nobody wanted to deal with the card at three and eventually in October of 2005 they banned Tribe-Infecting Virus never to see the light of day in legal play until the OCG decided in in October of 2017 to limit it and eventually completely free it from the list in April of 2018, and I’ll get into that in a bit. All Tribe-Infecting Virus did was upon discarding 1 card, you could declare a Type and destroy all monsters on the field with that type. This could clear multiple monsters with just a few cards, and that was insane back in the early to mid 2000s, so it got its warranted ban back then. 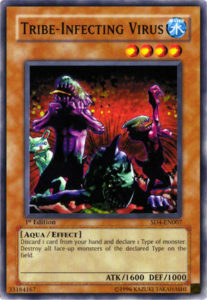 It helped that Tribe-Infecting Virus had the type of Aqua, meaning it was very niche to run decks with strong Aqua monsters meaning Tribe would never really destroy itself, so your opponent had to get rid of it before you wanted to destroy more of their monsters with it. It was a problematic card back then, and got banned when it deserved so. Now can Tribe-Infecting Virus come back like the OCG? Yes and at three. Destroying monsters with multiple cards isn’t as good as in 2005 when this card was first banned. You prefer to do that without using a ton of cards, or at least keeping whatever card did it like a monster being summoned clearing the board. Sure it can work in Mermail Atlantean decks maybe, but it will not break that deck wide open. They have enough good ways to trigger Atlantean effects. Don’t get me started on whatever Tribe destroys probably will have a floating effect. Tribe is welcome at three once again, this isn’t Goat Format. Back in 2017, after Zoodiac and True Draco were slaughtered in the OCG, Worlds needed a different deck to play since the Worlds list was a mix of TCG and OCG, enter the True King Dinosaur deck. Even without Dragonic Diagram, True King Lithosagym in Dinosaurs could easily pop two Baby Dinosaurs to Special Summon itself from the hand and since both were EARTH, you could banish three cards from your opponent’s Extra Deck. The baby Dinos would later float into two more Dinosaurs to maybe make a Dolkka or Laggia for some disruption and Lithosagym could easily help make a True King of All Calamities with Denglong being legal. The OCG did hit the True King Dino deck by limiting Souleating Oviraptor, Babycerasaurus, Denglong, and semi-limited Fossil Dig. 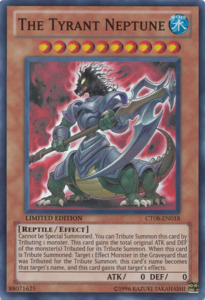 The TCG wanted to hit the True King Dino deck as well cause they knew they were getting rid of Zoodiac and hitting the consistency of True Draco by banning Dinomight and liminting Ignis, so they took a different approach of limiting Miscellaneosaurus as well as banning Denglong and this to make the True King Dino deck less potent while keeping Dinosaurs as a whole still good. Can True King Lithosagym come back? Not with both baby Dinos and Souleating Oviraptor at three it can’t. Popping two babies and cleaning your opponent’s Extra Deck of three cards is very good since those babies will float into Dinos for a potential Laggia or Dolkka play. Even popping one baby and some other random monster is very powerful for Lithosagym, even though then you won’t banish from the opponent’s Extra Deck unless the other monster was EARTH. This along with Dragonic Diagram being at three, both babies at three, and Oviraptor is begging for trouble. 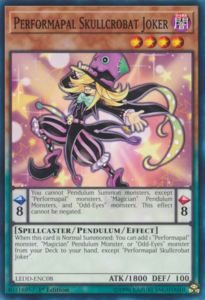 Maybe ban Diagram like the OCG did and then we could talk maybe (emphasis on maybe), but there isn’t reason to ban Diagram in the TCG, so this card is staying banned. This is going to be different as Victory Dragon isn’t really banned because of it being broken, it’s banned because of ruling debates. See, Victory Dragon cannot be Special Summoned and must be Tribute Summoned by tributing 3 Dragons. If this card attacks directly and makes your opponent’s life points 0, you win the match. Not too broken because of the specific way of summoning it, but the rulings were where this is a pain. See, if the opponent surrendered before Victory Dragon attacked directly, there is a debate now whether said person should lose the match because Victory Dragon was likely going in for the direct attack or if they should continue the match since Victory Dragon didn’t make the direct attack. I believe the latter is ruled correct but it does cause a lot of issues I’m sure Konami didn’t want to deal with, so they banned Victory Dragon in April of 2006 (the TCG limited it for a format in September of 2006 just to let them play with it when it was released and maybe to see if players in the TCG were more honorable, spoiler alert is they weren’t) and they later made every other card like Victory Dragon unable to be used in a Duel (which they are World’s prize cards and get limited printings, so whoever had them likely wouldn’t even play them since they aren’t truly broken). Oh boy, this card seems like a ton of fun. Yata-Garasu is the last banned Main Deck monster I’ll discuss since it is the only banned Main Deck monster left until future lists ban more. Yata-Garasu is a Spirit monster (so it goes back to your hand on your End Phase when it was Normal/Flip Summoned) and if it declares a direct attack, your opponent cannot draw a card during their next Draw Phase. 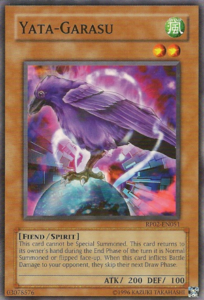 This worked in tandem with Chaos Emperor Dragon nuking the field and hands while you had a Sangan or Witch of the Black Forest to search Yata when they left and then you summoned Yata and attacked so your opponent couldn’t draw while at the same time having no cards, so you kept poking them with a small bird for 200 damage until you can draw a monster that can put enough damage for game on the field. I know it is a Spirit Monster, but you always kept Normal Summoning Yata again when you couldn’t go for game. This spakred the first Forbidden cards to come to the TCG in August of 2004 and Yata and Chaos Emperor Dragon were both banned and never returned, except in January of 2019 when Chaos Emperor Dragon got its errata. Now can Yata come back? I’ve heard arguments for it. Sangan, Witch of the Black Forest, and Chaos Emperor Dragon have all been errataed so this combo is impossible now, but getting your opponent in the position where Yata can attack while your opponent has nothing doesn’t sound fun to deal with. I don’t know how hard that will be to set up, but if it is a very niche situation, then maybe we could see 1 Yata come back. If that situation becomes common, then Yata can’t come back. Having no cards in the hand or field while Yata is attacking you directly is a pain if your graveyard has nothing to stop it and let you draw. Wow there are a lot of good monsters in the Main Deck, past or present, and we will only add to this list as we maybe decrease it with some cards I said could definitely come back returning to us. Some are just not as good anymore because the card alone was power-crept or the archetype it was part of was power-crept but some of these cards never changed when it comes to how good they are. I can’t wait to get into the Extra Deck monsters that are Forbidden next part.